Contains seven genuine Dremel Saw-Max cutting wheels. Includes: (1) SM500 wood and plastic carbide wheel, (1) SM540 tile diamond wheel, (2) SM520 masonry cut-off wheels and (3) SM510 metal cut-off wheels. Versatile brush for removing rust and corrosion, and polishing metal surfaces. Deburr and blend surface junctures, clean electrical components. Pack includes two carbon steel brush accessories. These Sander Bands from Dremel are perfect for rough sanding and smoothing wood. Also work wonders on fibreglass, removing rust from metal surfaces and shaping rubber surfaces. Sander bands are easily replaceable on drums. High Speed Cutters can be used for shaping, hollowing, grooving, slotting, making tapered holes in soft metals, plastics, and woods. The RotoSaw+ with dust vault combines the power of a 6 Amp cutting tool with an integrated dust collection system, for use on the toughest materials. The system eliminates the need for a vacuum, making it ideal for fast, convenient use in finished spaces, saving you time and money on the job. Additionally, the RotoSaw+ features an on/off switch, variable speed and soft grip to improve accuracy and control. For your next indoor remodelling project, trust the RotoSaw+ with dust vault to get the job done right- without the mess. One year warranty. 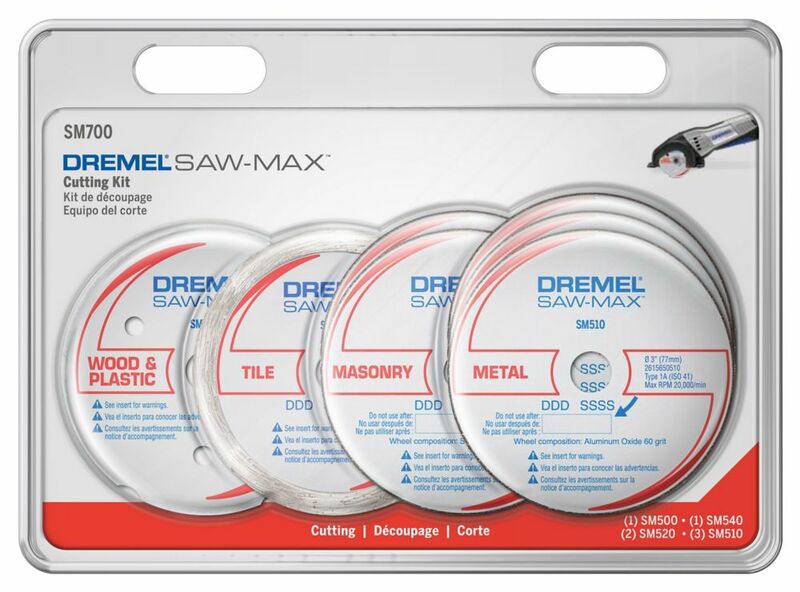 Saw-Max Cutting Kit, 7-Piece Contains seven genuine Dremel Saw-Max cutting wheels. Includes: (1) SM500 wood and plastic carbide wheel, (1) SM540 tile diamond wheel, (2) SM520 masonry cut-off wheels and (3) SM510 metal cut-off wheels. Saw-Max Cutting Kit, 7-Piece is rated 4.6 out of 5 by 20. Rated 5 out of 5 by HomeDepotCustomer from We bought the Dremel combo saw kit for light work... We bought the Dremel combo saw kit for light work in tight places, mostly in our home, the only thing I regret it not checking on how many extra blades comes with the saws, so we had to order extra blades, my opinion when a saw fails it is usually because it is abused, mainly not using sharp blades is one of the worst abuses, and trying to cut oversized material that the saws were not made for, so I would recommend to Dremel to add an extra packs of blades and charge a little more, they are great tools and the extra cost would be worth it. Rated 5 out of 5 by William from Great value.... Great value.